Mass Oyster will be recycling oyster shell and have exhibit at a booth at the Boston Seafood Festival on Saturday September 28. It will be on Fan Pier at the Bank of America Pavillion. The festival runs from The festival supports the Boston Fisheries Foundation. The festival is $10 for adults and children under 6 are free. The price of admission covers all entertainment; enjoy the oyster shucking contest, chef cooking demonstrations, education and nutrition, kids activities, and music. There are a few food vendors that will be offering free seafood samples; the rest of the food vendors will be offering a limited menu of small plates. The average cost of a plate is under $10. Big Rock Oyster Co. of Dennis will be selling oysters on the half shell. Develop a Maritime Fisheries Museum to honor our heritage. They will be kicking off the festival weekend with a very special Boston Seafood Gala on Friday September 27, 2013. 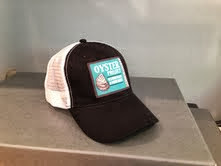 Mass Oyster hat sales support restoring oysters. We also will have a booth with tattoos for the kids, educational materials, our famous photo cut-out and mass oyster apparel for sale. Stop in and say "Hello"